Just beyond the stunning beaches of Plai Laem, lapped by gentle blue waters, lies this contemporary jewel. You know you have discovered somewhere incredibly special when you walk through the doors of this exclusive residence. Four en-suite master bedrooms two on the entrance level and two on the upper level, all boasting the breathtaking panoramic views of the turquoise waters that unfold ahead of you. In the true spirit of indulgence, the villa offers hot tubs, double showers, twin sinks, oil burners in the bathrooms to multimedia entertainment systems with 400 movies, high speed wi-fi, desk space, loungers, minibar in the bedrooms. Drenched in unending ocean views, this gorgeous 4-bedroom villa is located on the exclusive five star location of the Plai Laem Peninsula. Tamed for sophisticated tastes, the villas sight line unfolds with the neighboring tropical island of Koh Som, gleaming in the near distance with its golden shores and turquoise waters. Whilst sharing this canvas, with the curvaceous curves of Koh Samui’s bays, unwinding to meet the Marine Park and its truly spectacular sunset display. Leaving the world behind, guests can enjoy complete privacy in contemporary elegance, the perfect place to rejuvenate in style. Descend into distant worlds as the open living area allows sea breezes to flow through the contemporary interior. Elegantly furnished to a luxurious spec, guests can enjoy this sumptuous living space. Bespoke furnishings allow guests to recline back in total comfort whilst immersing themselves in the state of the art multi media entertainment system with 65"curve 4K ultra HD 3D Smart TV and complete integrated surround sound speaker system throughout the indoor and outdoor living areas. The well appointed high end western kitchen is ideally located in this open plan design and offers guests a home away from home feel, furnished with all possible cooking accessories. This private and spacious living area unfolds onto the open terrace with a covered dining area for 8, surrounded in seafront splendour. This large shaded space also features a comfortable chill zone for guests to truly indulge in that al fresco tropical feel. The absolute sea frontage pool and terrace area offers a particularly private oceanfront landscape. Guests can indulge in a refreshing swim in the curvaceous 18m infinity pool, enjoy a pampering dip in the massaging jet jacuzzi or perhaps a sundowner cocktail from the swim up bar. Kept perfectly chilled by the innovative curved ice bucket, featured along the length of the bar, setting a mood for fun and romance. The large sun terrace is peppered with relaxing loungers ideally positioned for guests to enjoy the poolside elegance whilst listening to the hypnotic sounds of the gentle waves. Descend into the garden immersed in a total seascape, offering guests yet another level to indulge in. This landscaped garden is furnished with soft oversized beanbags, on the golfing grass lawn, soaked in unending sea views. This unbeatable setting entices guests to simply relax or take a dip, in the azure sea lapping at their feet. By night the Moroccan lanterns transform this stunning setting. Guests can relax and watch the spectacular sunset and its kaleidoscopic display perform its nightly ritual, directly in front of the villa. A breathtaking moment offered by this incredibly unique locale. The four master bedrooms have been designed with a cool contemporary elegance. Each private sanctuary has it’s own oceanfront terrace with seating for 2, offering guests the possibility to enjoy individual down time bathed in the tropical seascape. Each bedroom has its own Smart TV, with DVD and Blue Ray Players, Satellite Channels and independent access to the Movies Library with over 400 of the latest titles for those times that guests may just need a bit of “me” time. The beautifully designed en-suite bathrooms feature double sinks with soft water rain showers. There is of course the soak away lovers tub positioned centre stage for more indulgence. The Villa offers full time staff to assist guests at any time. The dedicated team of 2 will help guests in truly getting into holiday mode, able to fulfil on an array of essential holiday requests. The in house Chef Service offers exquisite Thai cuisine and can be requested at any time allowing the chef to buy all fresh produce to create some truly delectable delights. Refreshing cocktails are close at hand, with some truly tropical twists on the menu. Guests can also request in villa massages, with an extensive spa treatment list, yoga, Muay Thai, and even salsa lessons. The villa is perfectly located with a true feel of being on your very own private island because of the natural shape of this beautiful peninsula, offering full privacy and pure comfort yet only 10 minutes from everywhere. 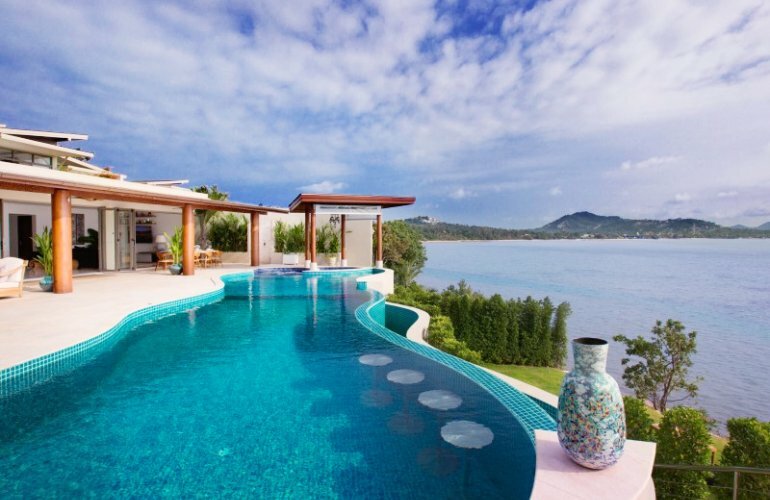 With 5 star neighbours such as Six Senses and TongSaiBay, guests can be assured of a totally exclusive residence, on some of Koh Samui’s most sought after real estate.. This ideal positioning in Plai Laem, has guests being able to easily indulge in all kinds of island activities, from shopping in Chaweng, to restaurants in Bophut’s Fisherman’s Village or even jungle excursions in the tropical rainforests of Maenam, nothing is too far away !